I got the tank back yesterday and it looks fantastic. I just finished installing it. You two are people that back up your product and you are to be commended for standing behind your work. I'm sure the problem I had is not common, but thanks for making it right and fast too!!!! I would not hesitate to have more work done by you in the future. I recieved my tank and fenders Thursday Man what a paint job I love it. My girlfriend who was a little reluctant about the colors just loves it. Scott I'am very very very happy ! I will send some pictures when I get it put back together and I will do everything it takes to promote your business. Jody thankyou for being so honest about the $100.00 error, I would not have caught that. Scott I plan on having you do another paint job for me in a year or two, but I want you to supply the sheet metal. Again thankyou very much you guys. Every step of the way. With my constant changing of design and not sure what I really wanted for a custom paint job. For the first time I was blown away to say the least. I brought my bike to Scott at 12:30pm on a Friday afternoon to have the new sheetmetal installed. Service than ATTITUDE CUSTOM PAINT. I bought the bike new in 2001. If I knew then what I know now I would have waited till now to buy a used V-Star and chop it up. Would have saved several thousand. Hey…know anyone who needs V-Star parts? Anyway. New rims and tires started this rebuild off followed by removing the speedo and stretching then flat topping the tank.Removed the lighting on the tail and added a custom glass front fender.Scott and crew gave me the wicked paint topped off with that crazy Evil Punisher skull. Pictures do not do this paint justice. Must be seen in person and in the sun. WOW!!!! I could not be happier and would even send my mother to Scott for paint. THAT'S HOW MUCH I LOVE AND TRUST ATTITUDE CUSTOM PAINT! Today was a great day. I took my bike out for the first time with my new paint job. And now, it's a real head turner! Great service sells itself and you guys excel at that — evidence, I gave your name and website address to three people today. You all took a high tech, impersonal Internet interaction and managed to create an incredible customer experience. From Scott answering my initial emails and working with me on the design and colors to Jody sending the pictures during the process and her careful, well-packed packages that arrived this week. I worked 8 hours straight to get the bike back together and I am in awe. The quality, the detail, the artistry — all surpassed my expectations. And, just ask my wife, I hold everyone to very high standards. Attitude Custom Painting gets all high marks. Thanks for earning another happy customer and a lifetime fan. Scott / Jody , thanks for everything, I was a little skeptical at the thought of sending my sheetmetal 1500 miles for a paint job . but after checking out your web site about 20 different times, I figured I'd roll the dice (and what a good roll it was) everything went smooth .from the quick responses to my 5-6 e-mails to Jody answering the phone for any questions I had. the most difficult part in the whole process was finding the boxes to ship my parts in !! the paint job is outstanding I mean effin outstanding .smooth as silk. I'll be pointing my buddies in your direction for there custom paint with ATTITUDE !! Like the majority of your customers I was more than a little apprehensive going "over the web" for custom paint for my Nightrain. 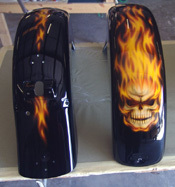 of horror stories come back from "custom paint shops". Received my tin yesterday and this is without a doubt the finest job I've seen to date. You captured perfectly the subtle, "but visible" ghost flames I tried to describe during our extensive e-mails. Finished assembly today and it looks even better on the bike! Your rapid response to my questions, the quality of the web site, and the hundreds of photos of previous work all gave me the confidence to trust "Death Threat" to your shop. You exceeded my expectations. 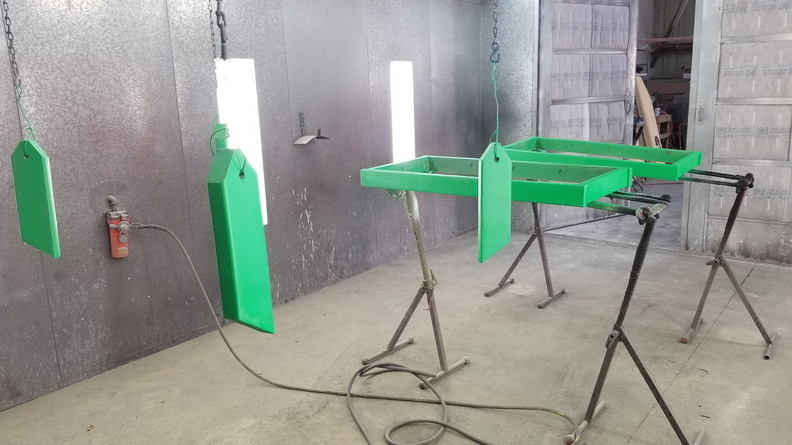 To any potential customers reading this – HAVE NO FEAR – Scott, Jody and crew are a truly top quality, honest, and mostly incredibly talented custom paint shop. Thanks for the beautiful work you did with the paint job. I was a little concerned about doing business, with us being so far apart. However,you both displayed great communication with the e-mails and phone calls. I felt involved in the process from start to finish. The bike has been reassembled with the new tins and is on display at the local Harley Shop in Concord, N.H. The employees tell me that virtually everyone stops to admire the Fat Boy especially the awesome paint. Thanks again, it was a pleasure dealing with both of you. Your work speaks for itself and such attention to detail and customer focus are rare indeed. I'd like to thank you for NOT ONE, but TWO outstanding paint jobs!! In fact I haven't even received the 2nd set yet, but I am so confident it'll be amazing I'm already writing to you! Buying a paint set sight unseen over the internet could sound like a crazy idea, but I have to say you guy's made the experience as easy as ever. Scott, you know I changed my mind about 500 times! and each time you were right there with answers, suggestions and assurances, and I really appreciate that, you answered emails promptly and I never felt that I was dealing with some unknown entity, even though we've never even spoke on the phone! 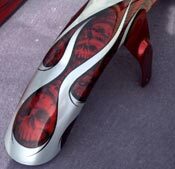 For anyone out there considering adding some "Attitude" to your bike, all I can say is go for it!! You WILL NOT be dissappointed. ps. I"ll upload the pics when it's all togethr!! I can't wait! I got my tank and fenders today and I just can not say enough. you all did an outstanding job on them. I am so pleased, it is hard for me to explain. The paint is impeccable and I absolutely love the colors the red is better then i had hoped for and it really shines in the sun lite. Well just wanted to say thanx and I will try to send business your way anytime I can. Thanks so much for the beautiful paint job. I felt like a little kid opening up Christmas presents when the packages arrived. Showed all my friends and they all loved it. Right now I have it on my dining room table, the tanks and fenders make a great center piece. It's amazing how when you walk around the table the paint job changes colors. Can't wait till Spring to put everything back together especially the stretch tank. Thanks again and I will send you pictures when I get it back together again. I got the sheet metal today and all I can say is oh my God…I cant believe how nice they came out…I will be sending the set for the credit like we talked about in the next couple of days…will definitely take pics and post them when its all together…just cant wait to see what it looks looks in the Sunlight..
.thanx again for your help and the great job on the tins…. This note is to express my appreciation for a job well done. I was considerably nervous doing this sort of business over the Internet, however your prompt, warm and thorough emails helped alleviate these concerns significantly. The job itself is quality. The colors are even, the clear deep and the ghost flames with the "Farrell flick" are expressive. You are not chintzy about the amount of flames as well, unlike another flame-job I had done elsewhere in the past. My ideas regarding the coloration I was looking for were acknowledged and followed through upon. The logo is straight and even. The packaging of the job to me was well above average. Turn around time was highly impressive, particularly considering it was the holiday season. Photos were sent to me as promised. Even some of my rather minuscule questions were answered in a positive respect, both through email and on the phone. Finally, the price was very reasonable, and I did compare to other paint shops, both local and on the web. 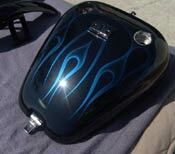 I would not hesitate to recommend Attitude Custom Painting to anyone based upon my experience. Thanks to both of you for everything. Ken Hines, Bridgewater MA '05 FXDL "molly"
I received my parts yesterday–They're absolutely flawless! I can't say enough good things about Attitude Custom Painting. Scott was extremely patient with me from day one of my 7 month quest to find the colors and scheme that suited me. He answered my many questions quickly…always within one business day. Jody was more than helpful when it came to finalizing our transaction–she even saved me quite a bit of money on my return shipping. Scott runs his business exactly the way it's described on the website: – They notified me when they received my parts and verified that they arrived in good condition. – I received a "progress report" email with pictures as promised. – Toward the completion of the job, I received a "final photos" email with plenty of pictures as well as my options for shipping and payment of my balance. 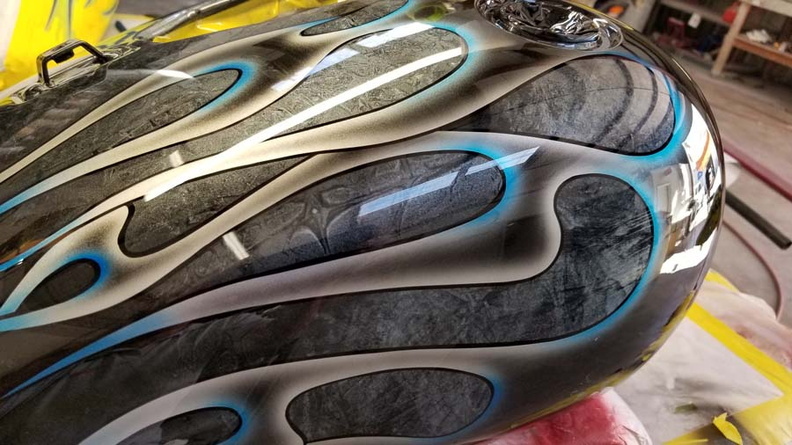 I couldn't be happier with the paint job on my parts or with every aspect of my transaction with Attitude Custom Painting. 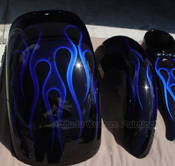 If I ever need another paint job, Attitude Custom Painting will do it! Thanks again to everyone for a job extremely well done. The parts arrived last friday and I must say they look INCREDIBLE… worth every penny!! I will have no problem handing out your business card to anyone that asks!! I WILL be showing off the finished bike this spring in Va Beach!! But before that, I've got a LOT of chrome to add/replace! I will be sure to send photos! Thanks again for your superior work and service. I have received the parts back yesterday as UPS estimated. It is once again a great job, very beautiful. The bike is going to get the new tins this weekend. I will send you photos. This is amazing work. I like how you can get what I am looking for from just a few words and reference jobs. I dreamt it up and you nailed it. Once again thanks for everything and will send photos this time. Happy Holidays from Ken. Received parts Dec 1st evening as stated in your note. Everything looks great and I'm looking forward to seeing them on the bike. I just want to thank you for a great e-shopping experience from start to finish. It is great to see a company take pride in what it does because those company's are far and few between. Again thanks for your help! Just a quick note to advise that the paint job showed up on time and in tact. It looks great. I now have a mountain of packing material in the shop. 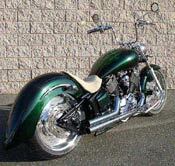 Please thank Scott for including the front fender tip light and the Softail Heritage emblems. I can use them. I'll get some photos off to you when I get it all together. Until next time. Be well and take care. This package comes with an awesome paint job that these guys did. Twin Cam 88-Samson pipes-S&S carb-250 Avon rear tire-dual horns for the idiots out there-and the most important feature on the bike is my paint .I am very pleased with the workmanship that was done. Just wanted to let you know I got the Paint Set today, that was fast. It's AWESOME, just as I knew it would be!!!!!!!!!!!!!!!!!!!!! I can hardly wait to get it all put on, I will send pics as soon as I get it done… I have to work everyday (except Thanksgiving day) till a week from Sun so I'm going to wait till then to get started. Even though I'm in a hurry to get it all done I'm going to take my time as to make sure I don't do anything to mess it up, plus I'm waiting on a New Fuel Gauge before the tank. Will talk & send pics soon… Have a Very Happy Thanksgiving. Michael & Jennifer. Just wanted to let you know I received everything Friday. Everything was packed wonderfully. In fact I thought I might be getting an Egyptian artifact the way it was packed. I unpacked it all and am letting the parts "breathe". I have clean cotton cloths covering them. They look most awesome in person. Everyone that I showed them to last Friday said the same. The detail in the job your crew did is unreal. I'm starting total teardown in two weeks. The frame and swingarm are going out to be chromed. I would think that by end of Feb I may have her all back in one piece. I will keep you updated on the progress with the bike and upload the pictures when she's done.